Lila Moonlight: If a turtle doesn't have a shell, is he homeless or naked? Just tripped over the coffee table that you moved AGAIN! :-) You're still rearranging! My biology teacher in high school -- a strange guy with a stranger sense of humor -- would tell us, totally deadpan: if you take the shell off of a turtle, it's just a bloody mess. Not all cute and naked like in the cartoons. So, I can't recommend trying to find out! 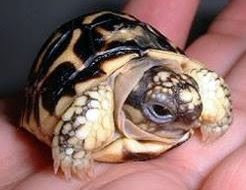 What a cute little turtle..and I love the new header.